Let’s face it. As much as we all enjoy visiting parks, one cannot live on a diet of corn dogs, funnel cake, popcorn, and ice cream alone--as much as one might like to try. Aside from some notable examples (such as Epcot and Silver Dollar City), food options are limited at most parks, and many people would rather eat "real meals" elsewhere. That’s what this thread is all about. Good local joints that may be a bit off the beaten tourist track, but are worth seeking out while you’re visiting a park. 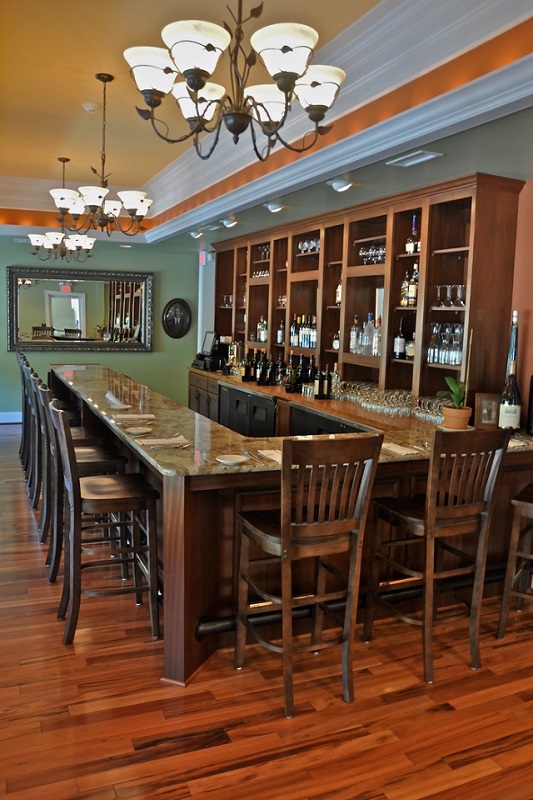 I’ll start us off with a few places that I enjoy as a local in Williamsburg, Virginia. 1. Try to choose one place for breakfast, lunch, and dinner; however, it's not required that you cover all these meals. 2. Remember that this must be a locally owned restaurant--no big chains. 3. Tell us what you like about the place. 4. Provide directions on how to get there from the park in question (if you can). 5. Post a few pictures of the place (if you can). 6. Be sure to include a link to a restaurant’s Web site, if applicable. 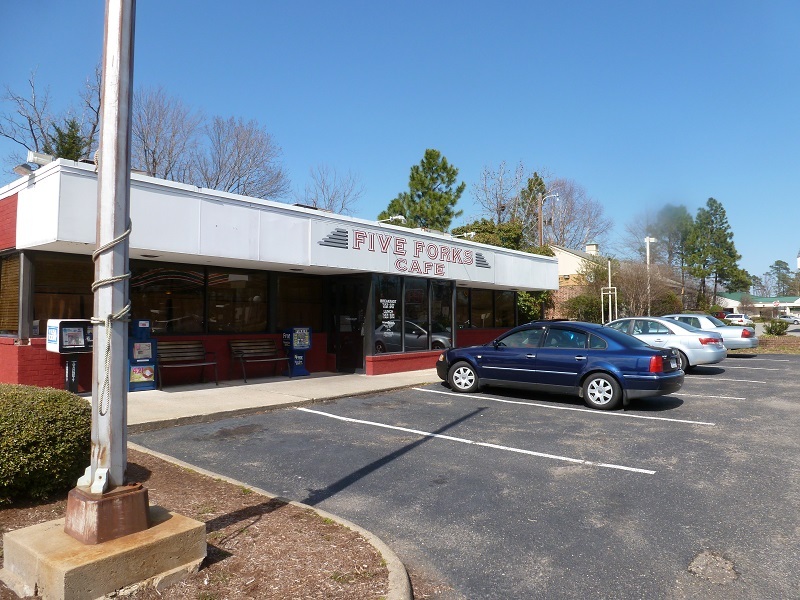 If you’re looking for a big breakfast that will keep you going until dinner (or beyond), Five Forks Cafe is the place. Every town needs a good diner--this is Williamsburg’s. I’ve yet to have a bad meal here, and I particularly like their corn cakes, two eggs, and bacon for breakfast. 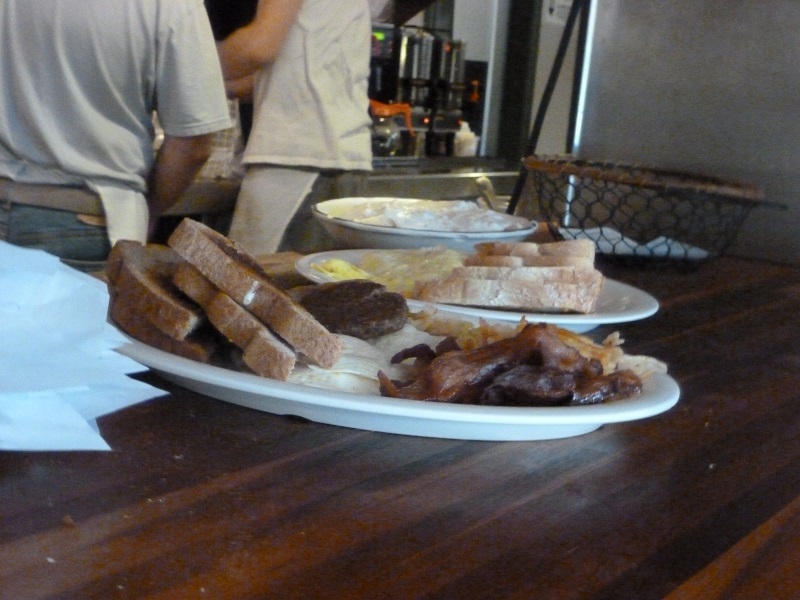 But if you really want to tank up, try the country-fried steak with two eggs, hash browns, and toast. They serve great biscuits and gravy, too. Be sure to check out the specials, as they sometimes throw in something more “esoteric,” such as eggs in garlic-and-spinach cream sauce or carrot cake pancakes. They serve breakfast all day. Don't be surprised if there's a line out the door at this place--it's quite popular with locals. Directions from BGW: Turn left on Rt. 60 as you leave the park. Turn left and merge onto Rt. 199 West. Turn left on Rt. 5 (John Tyler Highway). Five Forks Cafe is about two miles down Rt. 5 on the right. I think I’ve introduced more TPR members to Pierce’s than any other restaurant in Williamsburg. This is a true local institution that’s been cooking up the best damn pulled-pork sandwiches in the area since 1971--spicy, slightly sweet, and smoked to perfection. I usually get JC’s Special, which is a jumbo pork sandwich, fries, cookie, and a drink, but the ribs are pretty good, and those who don’t care for southern barbeque can always get a burger or chicken sandwich. Be sure to say “no slaw,” unless you want your sandwich topped with the stuff. 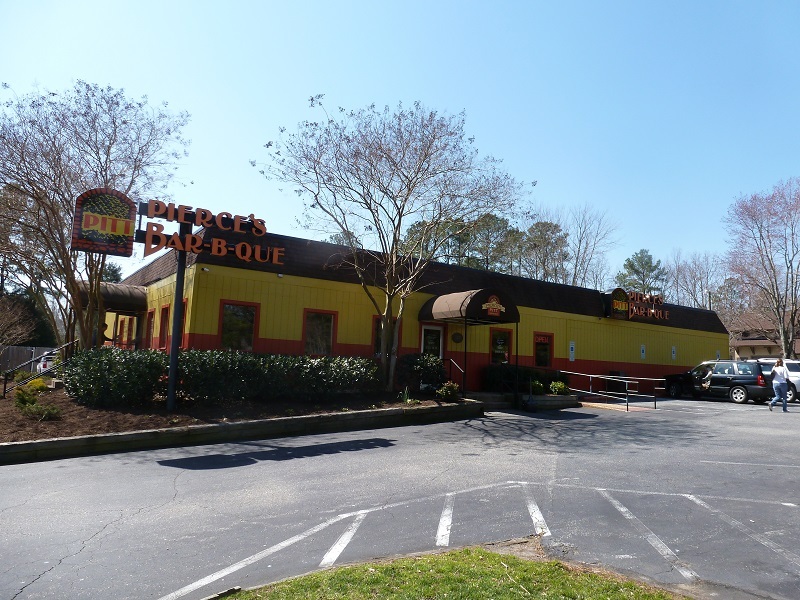 Be advised that this joint is usually very crowded at lunch, so don’t be shocked if you have to sit outside. Directions from BGW: Take I-64 West (toward Richmond). Take Exit 238 (Camp Peary/Williamsburg) and turn left. Turn right at the first light (E. Rochambeau) and drive about three miles. It’s pretty hard to miss the yellow-and-orange building surrounded by cars on your left, but if you reach Great Wolf Lodge, you’ve gone about a mile too far. This place is a bit tricker to get to from Busch Gardens, but it’s well worth seeking out, as the food is excellent. 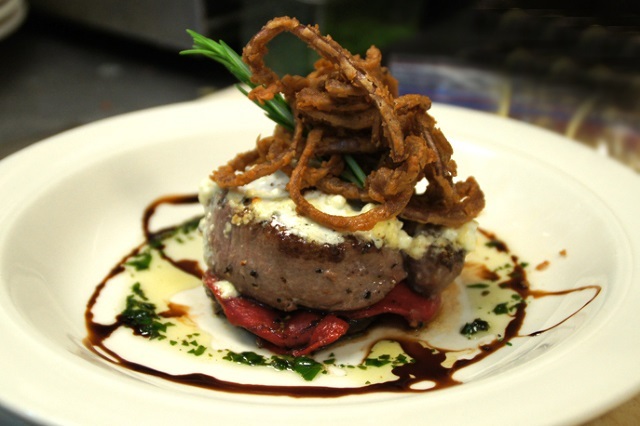 I’m particularly fond of the Steak al Gorgonzola--a six-ounce petite filet on top of a portabella mushroom and roasted red peppers, topped with Gorgonzola butter and balsamic fried onions. Their lentil soup is excellent, as are their desserts (great cannolis). They also make good pizza. The last time I ate there, I enjoyed the Pork Fontana. They host wine-tasting meals there from time to time, as well. Directions from BGW: Take I-64 West (toward Richmond). Take Exit 238 (Camp Peary/Williamsburg) and turn left. Turn right at the first light (E. Rochambeau). Turn left on Airport Road (Rt. 645)--you’ll drive past Waller Mill Park and Reservoir. Turn right onto Rt. 60. Turn left on Olde Towne Road (the next intersection). 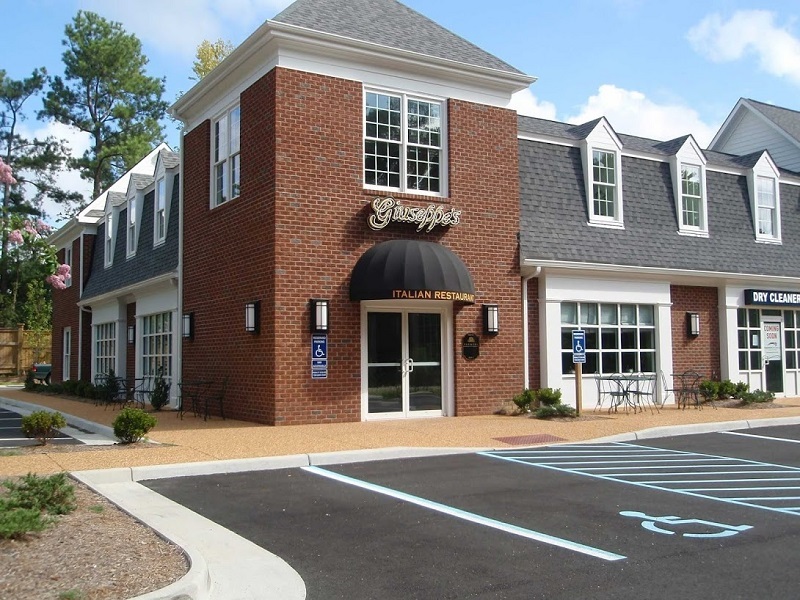 Giuseppe’s will be on the right, just after the shopping center. Everybody ready for some breakfast? 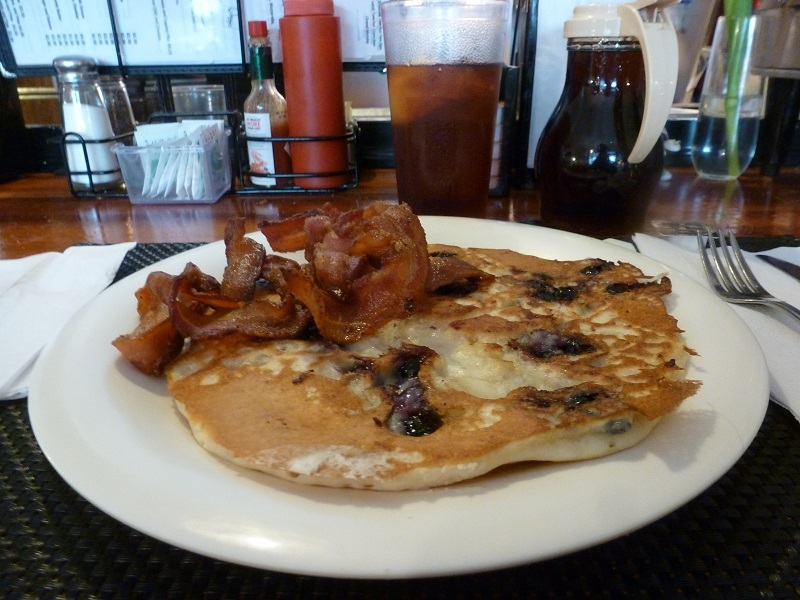 I'm a big fan of their corn cakes, but the blueberry pancake with a side of bacon was calling me today--yum! Perhaps you'd like something a bit fancier for dinner. Giuseppe's has an excellent wine list. Behold the Steak al Gorgonzola! Pierce's was so busy last Saturday that I had to park across the road. Don't expect any fancy china or cutlery with your JC's Special--just a damn good sammich. Last edited by cfc on Sat Feb 10, 2018 2:16 pm. That Steak al Gorgonzola looks fantastic! I'll have six please! This is a great idea, Chuck! Just a thought...could an index be created here on the first page? I think it would help people to find local eats a lot easier than digging through the inevitable 40 + pages to find that special place to eat outside Beech Bend or in the Dells for example. Maybe organize it by park/location. And blueberry pancakes with bacon...YES!!! Here is one place near Magic Mountain that I always try to make a point to visit. It is a nice little barbecue joint that kind of splits the difference between Barbecue and grill. It is a small place in the corner of a small shopping center. They make serviceable fries, but really good tri tip sandwiches, the kind that fall apart on you from the juices before you are even halfway done. I've also had a chance to try their excellent tri tip salads and great corn bread. Sadly though they discontinued their garlic rolls in favor of garlic sticks. The rolls were sinfully good and greasy, I'm pretty sure they were just fried balls of dough with a nice strong garlic mixture on top, but they were great. I'm sorry that I don't have any photos of the place but I was able to find a few over google image search. thrillerman1 wrote: This is a great idea, Chuck! Just a thought...could an index be created here on the first page? I think it would help people to find local eats a lot easier than digging through the inevitable 40 + pages to find that special place to eat outside Beech Bend or in the Dells for example. Maybe organize it by park/location. And blueberry pancakes with bacon...YES!!! Hmm--might just do that, based on how well the thread does. ^If there's good tri tip, I'm there! That's a good point about fries. Pierce's fries are average, too, but you can substitute hush puppies, and those are pretty good. Last edited by cfc on Mon Mar 25, 2013 12:00 pm. Here are some of my favorite places near SFFT. I have an excellent place for anyone going to Carowinds or if you're in the Charlotte area; it's called Cookout. It's amazing. They are best know for their milkshakes, but their burgers are very good as well. 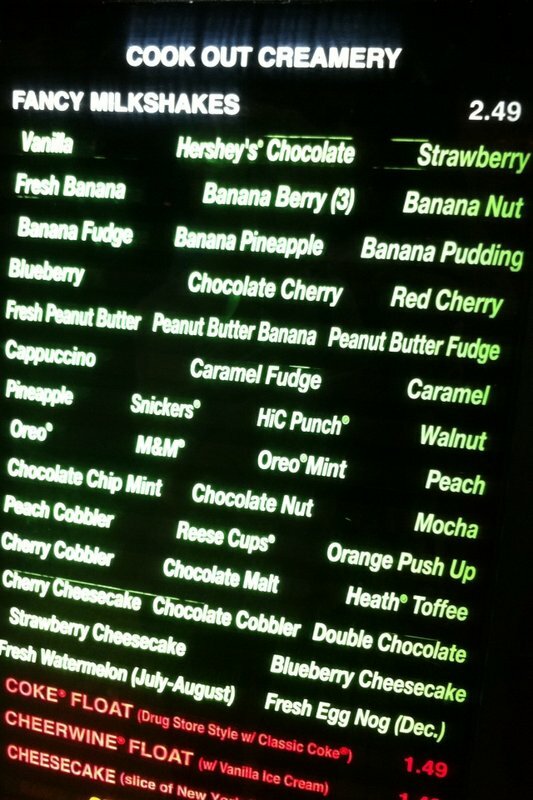 I have a picture of the menu of milkshakes below. 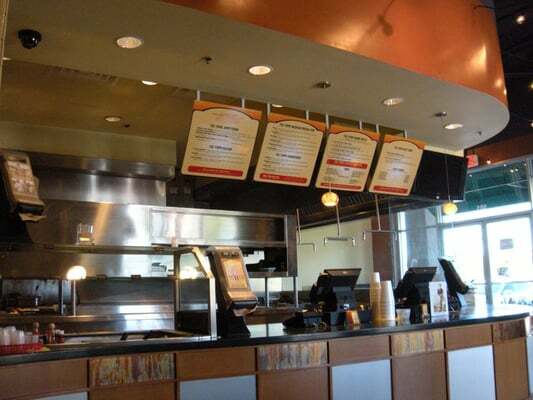 It is a chain, but the chain does not have nationwide locations,and they are only located in the North Carolina area. It is certainly worth checking out, it is good for both lunch and dinner. The other thing that keeps each location different from the next is that each location doesn't have the same flavor of milkshakes. Check out cookoutnc.com for locations and more information. I know all this doesn't meet the criteria, but I would rather contribute something rather than nothing. Last edited by Sir Clinksalot on Mon Mar 25, 2013 1:09 pm. 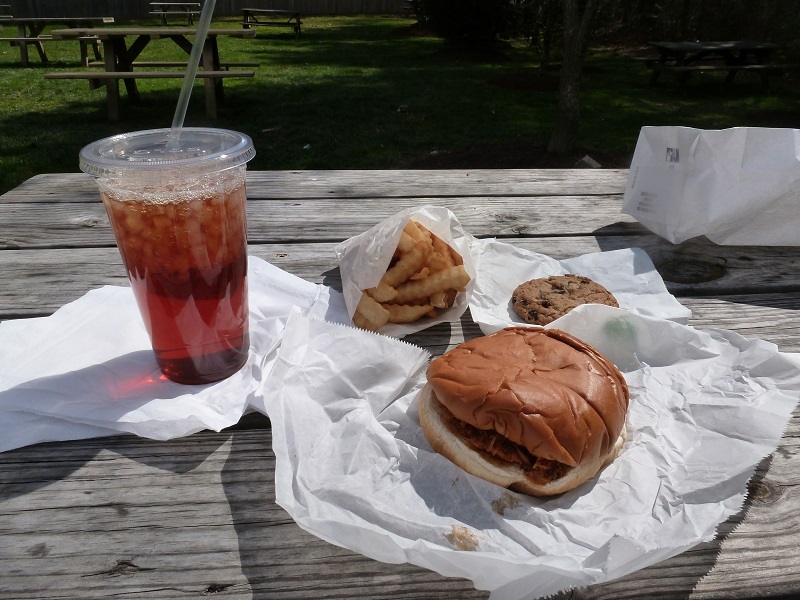 ^^I've heard good things about Cookout from friends of mine who live in North Carolina. I noticed one opened on Jefferson Avenue in Newport New, Va., near the airport. I have yet to try them. Breakfast: Seriousy, just try any of the pancake restaurants in the area and there are plenty to choose from. 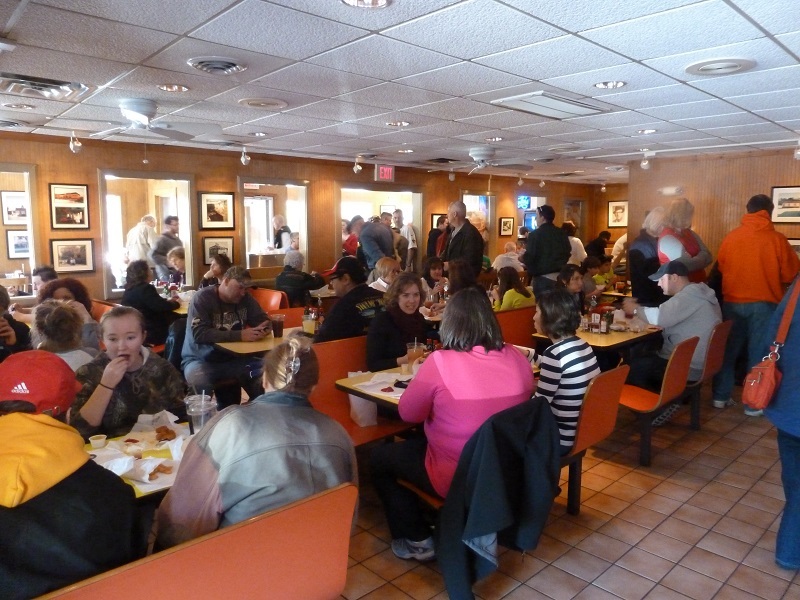 The Pancake Pantry is the most famous and also most crowded in the area. I am not a huge breakfast person but I have always had luck with the Flapjack's Pancake Cabin restaurants which have several locations in the general area of the park. Besides having your usual Southern fare, the restaurant(s) are most known for their apple fritters, apple butter and apple julep. I haven't had a meal here yet that I didn't like, just be sure not to fill up first on the amazing apple fritters! There is also a country store where you can buy their apple butter and also a winery on property. There are four locations in the Knoxville/Pigeon Forge area but I recommend the one in Gatlinburg. The food here is good but this is the place to go in the area if you are looking for some good micro-brews. 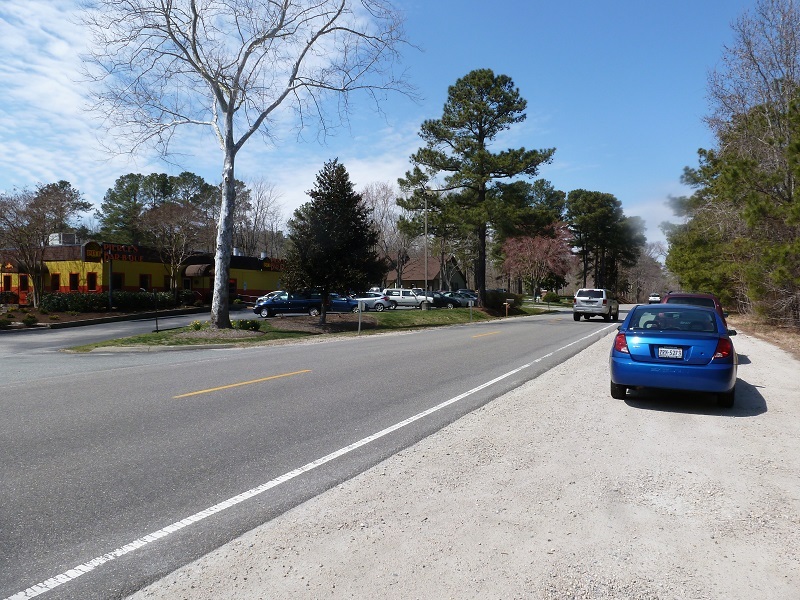 The Gatlinburg location is located in Calhoun's Village immediately behind Calhoun's and across the parkway from Ober Gatlinburg. Last edited by ernierocker on Mon Mar 25, 2013 1:26 pm.